For a thorough walkthrough of the Windows Phone 7 interface, I'd suggest checking out the detailed review of the HTC Surround that my colleague Eric Zeman has posted, or one of our hands-on videos. The Samsung Focus, and all current Windows Phone 7s, use the same exact interface design with very few manufacturer tweaks. I approached the Focus from the business user's perspective. Does WP7 help keep you informed and productive? Does it offer a work and life balance, while keeping the two appropriately separate? The answer is mixed, but business users might be disappointed to find that Windows Phone 7 is much more a consumer interface than the old business stalwart, Windows Mobile. Foremost, the interface looks wonderful. You have to see the phone in person, in action, to truly appreciate the effort and level of detail that went into the design, because it's not apparent until you actually touch the screen. The whole design is very fluid, with layers upon layers that create depth and motion and you navigate the menus. The so-called Metro UI tries to eschew the chrome plating and cartoonish colors of today's Android and iOS devices. At its best, it succeeds, offering information up front at a quick glance. At it's worst, though, the lack of explanation and detail can be confusing, especially to new users (and we're all new users for WP7). 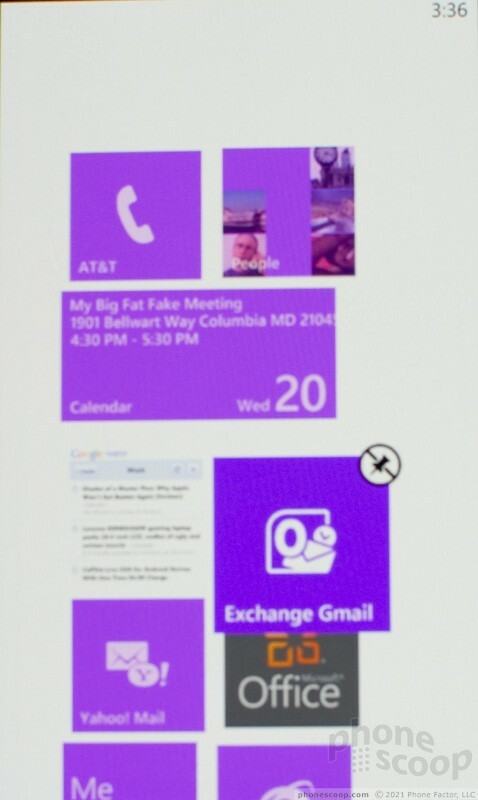 On the Start screen, Windows Phone 7 offers so-called Live tiles. Microsoft is pretty open-ended about what these Live tiles might be, or what they can do, so I expect this is one area where manufacturers will differentiate themselves in the future. Tiles update themselves, to some extent, but even though they offer a quick glance worth of information, business users might find they don't go far enough. Email apps tell you how many messages you have, for instance, but don't offer a preview of what those messages contain. That was a feature I liked very much on Windows Mobile 6.x phones, especially those running HTC's Sense interface. People tiles show you recent status updates, but only the first few words, so you'll probably click on them to read more anyway. The calendar shows your next event at a glance. 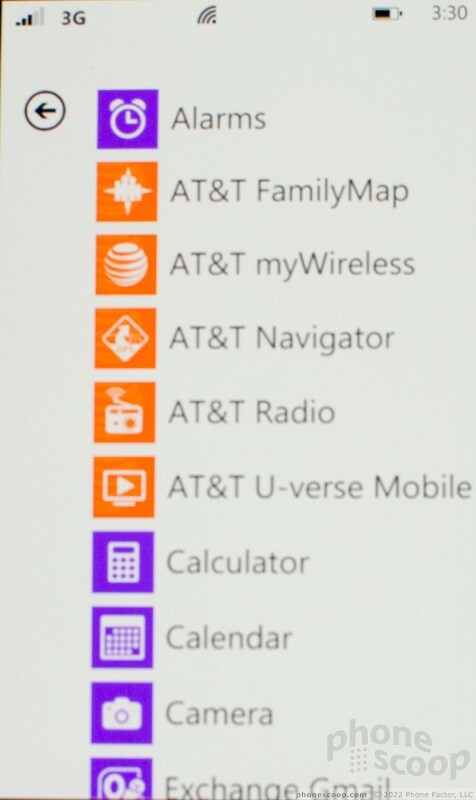 Microsoft might claim that you'll spend less time looking at your WP7 phone, but the Start screen doesn't offer as much information as it could. The interface relies on many tiny symbols and hidden actions to add functionality to the phone's core features. Often, an app might have a small row of icons at the bottom of the screen, and I had trouble figuring out what each stood for. Usually, there is an ellipsis you can tap to open up an explanation menu, sometimes with even more options hidden beneath. But a UI shouldn't need to have a button to explain what other buttons do. It should be obvious. Other times, there was no explanation, and I was left wondering what, for instance, the two arrows, pointing at each other, stood for in the calendar app. With it's clean, unadulterated look, the Windows Phone 7 interface can often leave you feeling abandoned, like features and options have been left out. You can usually hold your finger down for a pop-up menu, or access the ellipsis menu at the bottom of the screen, but if you still feel like there are features missing, you're not crazy. Windows Phone 7 feels both polished and thoughtful as well as incomplete. I am not sold on one of the basic design concepts. Objects and text in the menus will hang over to the next panel. If there is a panel to the right to which you can swipe, you'll usually know because either the text at the top of the screen seems to run off the display, or some picture will peek out from side, waiting to be revealed. The right side of my brain loves the original idea, a holdover from the excellent Zune interface. The left side of my brain wants things to look more orderly. Occasionally, text is clipped and does not find its end when you swipe to the next screen. You simply lose the end of a name or a sentence. Windows Phone 7 starts up very quickly. From a complete shutdown (pulling the battery out), the Samsung Focus started up and had me browsing the Internet in just over 20 seconds. That's very fast, compared to the minutes I can spend waiting for an Android or iPhone to start (or the days lost waiting for a WebOS device to fire up).